Placencia Village is located at the southern tip of the Placencia Peninsula. Coming down the peninsula by bus or car after you have left the Southern Highway, you will see resort after resort of very high-end establishments that offer very high-end accommodations at 150usd to 250 usd or more a night. Francis Ford Coppola owns a place called the Turtle Island Inn, very close to the airport outside of the Village. If you want to pamper yourself and don’t have to take out a second-mortgage, check it out. Or check out Roberts Grove a resort on the peninsula with an island in the Caribbean. Neither has what I’m looking for but I’ve talked to several couples who honey-mooned at Roberts Grove and loved it. When you pass the airport part way down the peninsula, you still have a half-hour to 45 min. drive to get to the Village of Placencia. The road years ago was unpaved, rocky, pitted and impassable during parts of the rainy season, bone-jarring at the best of times, but all that has changed in the past few years, or so I have been told. We haven’t been able to visit Placencia for a couple years but we look forward to a pleasant, paved-road experience when we next take the bus from Dangriga or Belize City across the Southern Highway to Placencia. The road ends abruptly at the sea at the end of the Village or the tip of the peninsula. Buses and cars have to turn around and head back north on the same road. This means that the rest of the village to the east is car, bus, motorcycle, quad, gasoline- driven vehicle free. Running parallel to the road, 100 yards away, a concrete sidewalk stretches over the sandy beach from one end of the Village to the other. The concrete sidewalk is joined to the paved road by boardwalks and paths. Placencia Village is a combination of Hopkins Village and Caye Caulker, tourist/traveller-oriented and charmingly small-scale but in a unique way. 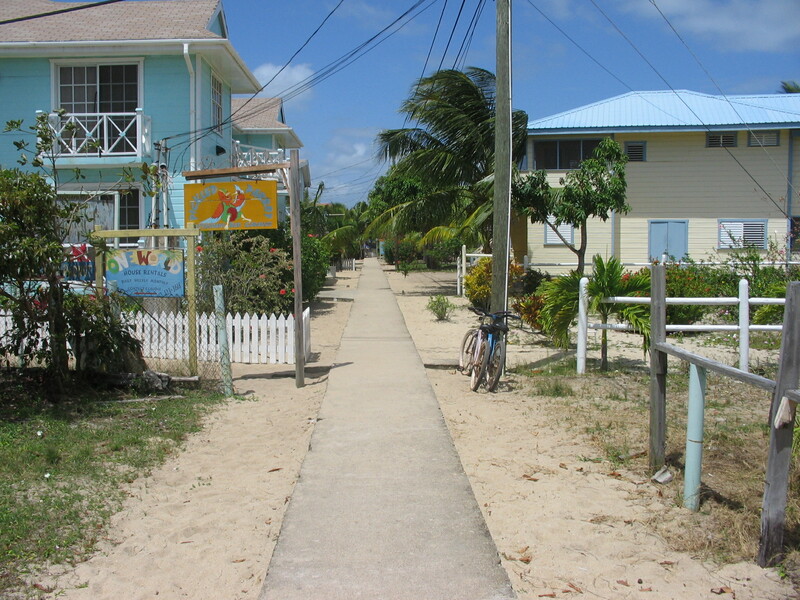 Both Hopkins and Caye Caulker have houses, stores, resorts and hotels that show the march of time from early colonial times to the present. Placencia Village, on the other hand, was razed to the ground by Hurricane Iris in 2001 (with no loss of life amongst its inhabitants) and virtually every building you see when you visit was constructed after 2001.This amazing re-construction is a great testament to the people of Placencia. As most towns in Belize, there is a 3-storey limit on the height of buildings so there is no over-shadowing by high-rise hotel/resorts. The buildings were replaced by concrete blocks covered by pastel-coloured plaster and by a combination of Belizean woods ready for the 21st century. 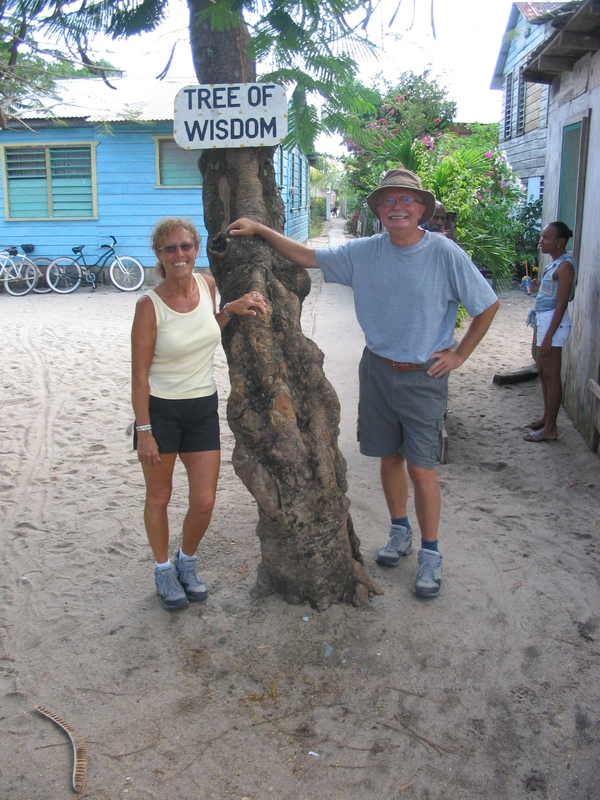 Placencia is bisected by the only road leading into and out of the village. From the road east to the Caribbean sea all the walk-ways and all the buildings are built on sand. The beach running north-south to the base of the peninsula is arguably the best beach in Belize. Lined by small hotels, resorts, cabanas and apartments, it is the place to stay for sun- and beach-lovers, but it will cost you a little more for the privilege. From the road west to the lagoon, the terrain is still sandy but often over-lain with grass and scrabbly bushes. Grocery stores, shops, bars and restaurants line the lagoon side, but you can find some places to stay also. There are many shops to check out as you promenade down the sidewalk and crisscross the boardwalks to the main road. Guatamalan, Mayan and Belize arts and crafts are sold here, mostly reasonably priced. You might haggle a little but you won’t win. The best deal you can make is to buy a number of items and ask for a discount. In between the shops, you will see many street-side vendors selling their wares, from trinkets to serious ebony carvings to intricate jewelry. These vendors tend to start high and expect to be haggled down. Rule of thumb (1): never pay more than you can afford and give the vendors a break. They are probably living a marginal existence. If you pay a few bucks more than you had to, don’t fret about it. Rule of thumb (2): if you really like it, buy it. Leave a few dollars behind in the village and take something nice home with you. The Village is small, probably only 300-500 full-time inhabitants, most of the workers coming to work in the morning from places like Seine Bight to the north and Independence, a ½ hour water taxi ride away. And yet there is much to discover, especially on the lagoon side. You can walk the beach for miles north up the peninsula. You can explore the lagoon side for hidden treasures. 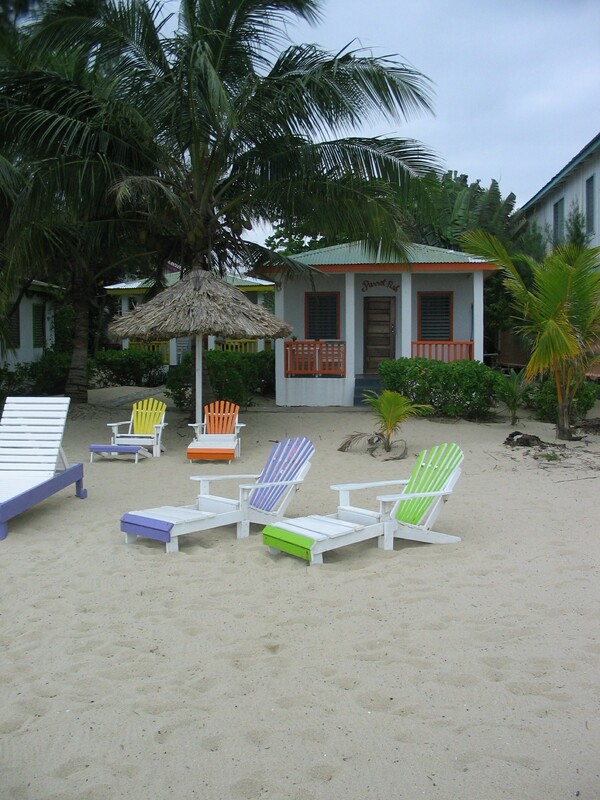 All in all, Placencia Village is the place to be for the pleasures of sun, sand and sea you went in search of. I’ve only recently started flying from town to town in Belize because I have always had the time and the inclination to take the bus and make the bus part of my adventure. But time and circumstances change, one ages and can’t do what one used to do, and the next time we visit Placencia it will be by one of the two in-house airlines, Tropic Air and Maya Island Air. Both flights from Belize take approx. 45 minutes and cost approx. 95 usd per adult, return. 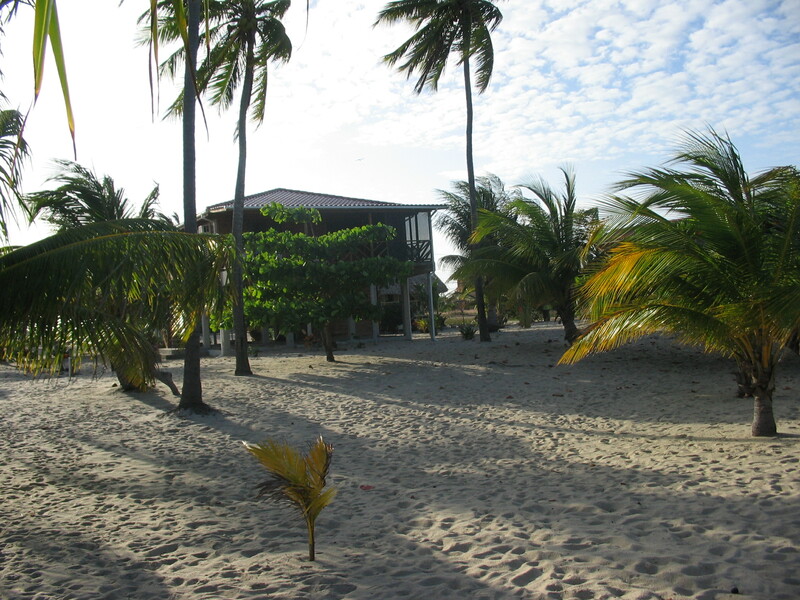 Have your host arrange for a pick up at the Placencia Airport. It will be an additional charge so make sure you know what it is before signing on. The sun will be getting ready to set by the time you arrive in Placencia Village if you take the last flight out of the International. There are two alternatives. One, rent a car and drive from the International to Placencia on the Western Hgwy to Belmopan, the capital of Belize. 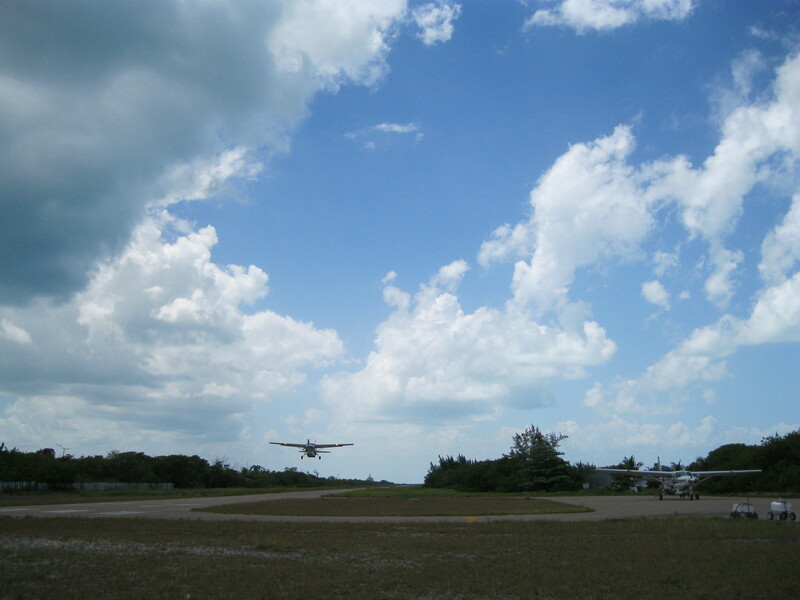 Take the Hummingbird Hgwy to Dangriga but turn off before Dangriga to the Southern Hgwy. Watch for signage taking you off the Southern Hgwy to Placencia, then down the Peninsula to the Village where you will have to stop to avoid driving into the Sea. What with travelling on new roads in a foreign country, I would guess at 4 hours +. I have never rented a car in Belize and likely never will. Check out car rentals in Belize. The other alternative is travel by bus. I used to take a taxi from the Airport to Belize City, stay a day or two in my favourite hotel, the Hotel Mopan on Regent Street, and take an early morning bus to Dangriga where I got on a bus to Placencia, probably about 4 hours if the connections were good. Can’t do that no mo. Hotel Mopan closed its doors and I don’t want to stay in Belize City till the cops take the City back from the robbers. See my posts on Belize City as a Nexus Destination and the Travel Advisory that I posted 2013/01/10. You could stay at one of the hotels identified there, north of the City and ask your host where to catch the bus to Belmopan. I’ve never done it that way but you could try. If you are on a 7-10 visit or even 2-3 weeks, check out the airlines. We first visited the Village two years after Hurricane Iris tore it apart. Much of the re-construction was complete by then. On spec, we stayed at the Sea Spray, steps away from the Caribbean Sea. It was okay but the place next to us caught our eye with its colourful cabanas and spectacular flower and plant gardens . Amazing what irrigation, hard work and a little love can do to a landscape. Anyway, we checked into the Ranguana Lodge the following year and every year after that when we visited the Village. In a way, The Ranguana was a beneficiary of the hurricane that destroyed three of the five cabanas and left two pounded into the beach, badly damaged but not destroyed. The hurricane forced all the entrepreneurs on the peninsula to take stock of what they had been before the storm and what they wanted to become after. Joy Leslie, the owner/proprietor of the Ranguana resolved that she wanted to salvage what she could from the shambles and haul the rest away to the town dump. 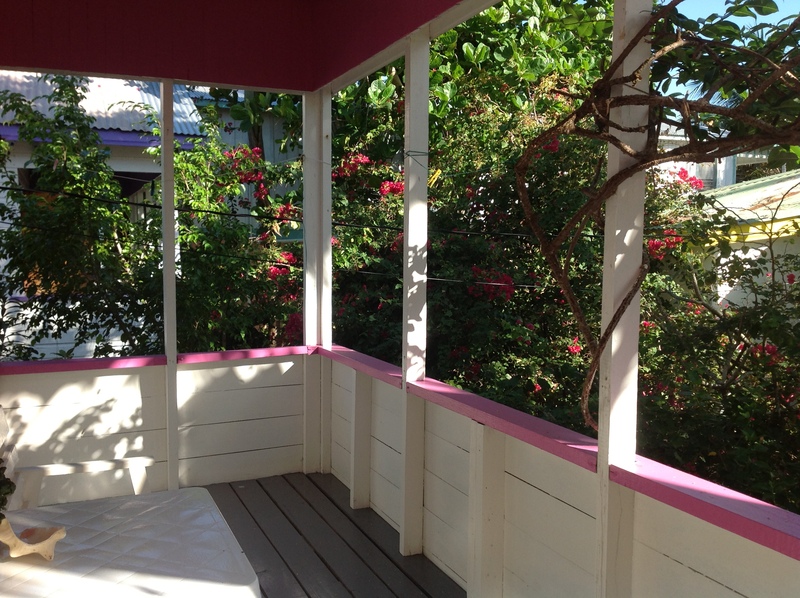 She built three cabanas out of concrete and plaster, painting them with pastel shades of lime green, purple and yellow trim. Inside was built from a variety of Belizean woods, all meant to last for years to come. She designed the inside of each cabana to be cozy and well-appointed with a bar fridge, coffee maker, T.V. and a/c and of course a private bath with hot cold water. These three cabanas are only yards away from the sea and each has a verandah and a hammock for people-watching and relaxation. Behind these three cabanas, she resurrected the salvaged two cabanas on sturdy concrete stilts. They are both larger than the other cabanas, with large verandahs and hammocks and deck chairs. Inside, the original wood paneled wall have been preserved giving the room a slightly colonial appearance. The room contains a full kitchen complete with stove, full fridge, microwave, cupboards and counters, kitchen table and chairs. There are two beds and a T.V. and ceiling and floor fans and again of course a full bathroom. Joy tries to make one significant change a year most memorable tiled floors and completely renovated bathroom. Joy Leslie is a part of the new generation on Placencia. She is a bright, energetic young woman with a green thumb and a great future. She has surrounded herself with strong support staff and together they keep the cabanas clean and the sandy grounds swept and bright with tropical plants and flowers. Sea Spray Hotel in the centre of the Village next to the Ranguana. 21 beachfront rooms and a couple of cabanas. Clean and reasonably priced in a good location. www.seasprayhotel.com. Miramar Apartments. Centre of the Village. 7 suites of various sizes. Family accommodation. www.miramarbelize.com. Colibri House, an octagonal building a little north of the Sea Spray. We had the tour. Quirky but worth a check. www.colibrihouseplacencia.com . When researching places to stay in Placencia Village, careful you don’t mistake the Placencia Peninsula with Placencia Village, the tip of the peninsula. There are many places north of the Village and there may be some good deals but by and large they are high-end to very high end they are not in the Village that I am promoting. Also, when researching places to stay, make sure you distinguish between the sea side and the lagoon side. The beach is on the sea side, a little bit more but if you want sun, sea and sand you have to pay the price. Check out my Travel Advisory below issued early in this year. Today, August 19, 2013, I am changing my advisory to a Travel Caution. We traveled through Belize City in March of this year (2013) and saw many signs of change for the better, especially regarding improvements in the infrastructure of the city’s core. The vibe was better and the taxi drivers we talked to said that crime was down, except for gang on gang related crime. So, it is still a city to be careful in. Don’t go out on your own at night. Definitely do not wander the streets after dark.. You don’t know the good areas from the bad so don’t take a chance. It’s no different from any city in the world. Talk to your host about where you can enjoy yourselves and where you should stay away from. Alarming News out of Belize City! The New Year has not begun well for Belizeans and visitors to Belize City. Gang warfare has plagued the City for years but recently erupted in violence with as many as 12 murders of rival gang members. For that reason I cannot recommend visiting Belize City until law and order again prevails as it has before. D’Nest Inn in Belama, a quiet residential area 3 miles out of the City and 7 miles from the International Airport. 82-92 usd double occupancy. Easy Inn on the Northern Hgwy, a few miles out of the City and 6-7 miles from the Airport. 65-75 usd. Bakadeer Inn, in the City but not too close to the downtown near the Belize Museum. Conningsby Inn, in the City, a well-established 12 room hotel in a relatively secure neighbourhood by the water front. All these establishments can b googled. For higher end hotels, check out Best Western Biltmore between the Airport and the City, the Princess Hotel in the centre of the City and the Radisson Hotel by the water front. FOR THE TIME BEING BELIZE CITY SHOULD BE CONSIDERED A ‘NEXUS’ DESTINATION. THAT IS, SOMEWHERE YOU GO TO GET SOMEWHERE ELSE.